It is to a certain extent astonishing and also to some extent upsetting to see many people suffer from repetitive cold and flu-like symptoms and the word Sinusitis is usually used for such cases. Humans have Sphenoid sinus, Frontal sinus, Ethmoid sinus and Maxillary sinus. Sinusitis is swelling of any of these sinuses. 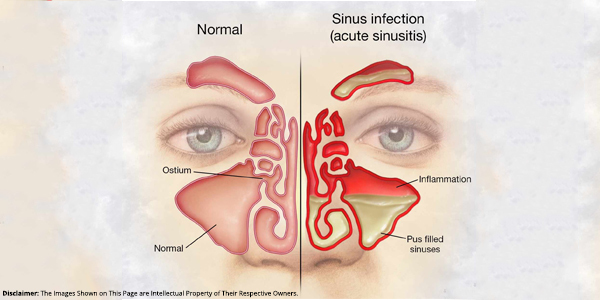 A sinus infection occurs when a pathogenic microorganism grows within a sinus and causes irregular blockage of the sinus ostium. Drainage of mucus and pus frequently occur when the blockage is alleviated. The drainage typically goes from the nasal passages to the throat or out the nostrils. Swelling of the air cavities in the passages of the nose is referred to as sinusitis which is usually caused by infection but can also be caused by allergy and irritation of the sinuses. It may be caused by anything that interferes with airflow into the sinuses and the drainage of mucus out of the sinuses like by some infections from a pathogenic microorganism. It commonly occurs when environmental pollens irritate the nasal passages, such as hay fever. Facial tenderness with pressure and pain. Cloudy or a discolored nasal discharge. Fever mostly associated with acute infection. A feeling of nasal stuffiness. Reduced sense of smell and taste. In noninfectious sinusitis or allergy related infections itching of eyes and sneezing may also be experienced by the patients. A sore throat and cough. In certain fungal infections, people may also experience foul smelling breath and ear pain. Occasionally toothache and jaw pain, fatigue and neck stiffness because of infection. Homeopathic treatment helps in enhancing the immunity and vivacity of the sinusitis patients preventing them from succumbing to recurring infections. Over the period of time, with the usages of effective homeopathic medicines, the attacks of sinusitis lessen down and a patient is much relieved of the condition. Dr Mahavrat Patel’s Cosmic Homeo Healing center is one of the leading providers of homeopathic treatment for sinusitis in Vadodara. The affected individuals get the best treatment for sinusitis here in Vadodara. The homeopaths here treat sinusitis by eliminating the allergic tendency or recurring tendency in the patient by treating them with a constitutional medicine thereby making the treatment extremely effective in nature. 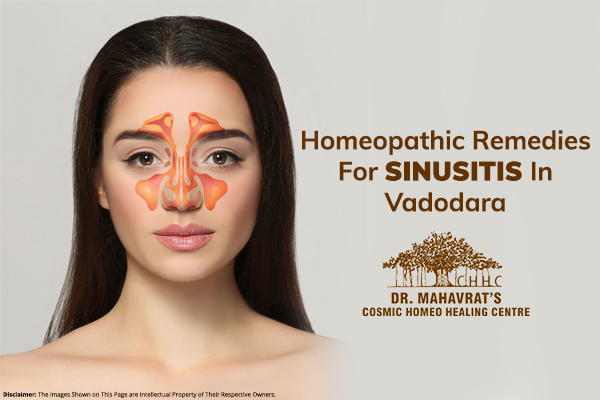 Dr Mahavrat Patel’s Cosmic Homeo Healing center is the top preference of the individuals affected by sinusitis in Vadodara. Sinusitis is the commonly used term for people who suffer from constant cold and flu like symptoms and the numbers are pretty staggering. Sinuses are hollow, air-filled cavities that are found in skull and have connection with the nasal airway through small hole in the bone known as Ostium. Their main function is to humidify and warm the inspired air, increase resonance of voice, insulate surroundings and act as buffer for facial trauma. The inflammation of these Sinuses is Sinusitis. Ostea (sinus openings) may be blocked because of tissue lining swelling and also swelling of side tissue of nasal passage which are due to allergies, tissue irritants (nasal sprays, cigarette smoke and cocaine) and common colds. Blockage may also be due to growth or tumors in proximity of the openings. Tenderness in face accompanied with pain and pressure. Sinusitis pain can be torturous due to its nature of generating pain in entire skull with patient most likely feeling like their eyes may pop out any second. Other traditional treatments may give temporary relief to the patient but in the long run carry more liabilities with eventual calls for surgery. Homeopathic treatments in turn are targeted to curing at the root level and can be preventive with more long lasting cures. The treatment is aimed to eradicate tendency or recurrence of Sinusitis and enhance immunity of patient. With use of medicine like Hydrastis and Kali Bich immediate relief for heavy head and stuffed nose can be provided. Homeopathic solutions ease mucus discharge thus relieving congestion, reduce swelling and overall provide pain and pressure relief. It can also avert permanent scar formation and damage to the nasal and sinus tissues. Homeopathy stresses on immunity and vitality to prevent future infection from occurring. With religious follow up and treatment Homeopathy can cure the patients of all complaints and also save them from long term effect of antibiotics and surgery trauma. Copyright © homeopathyhealing.net. All Rights Reserved.